Join us for our monthly gathering of the Goddesses for an evening of festivity and celebration of the divine feminine. These events are always guided by the Goddess we invoke and this evening, in honor of the Summer Solstice, we will be communing with Vesta, the Roman Fire Goddess of home and hearth. Here we will become as her Priestesses in ancient Rome keeping the sacred flame within the temple alive... Discovering our own sacred flame and what we need to do for ourselves to keep our own eternal flame well tended and strong. 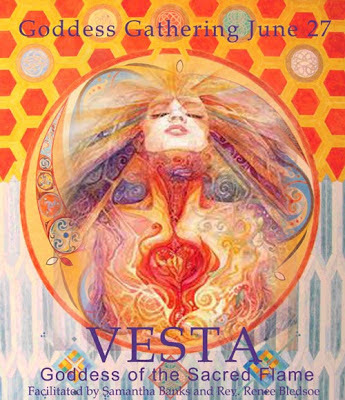 This is a wonderful opportunity to connect to your divine nature through the archetype of the beautiful Vesta and commune with other Goddesses! 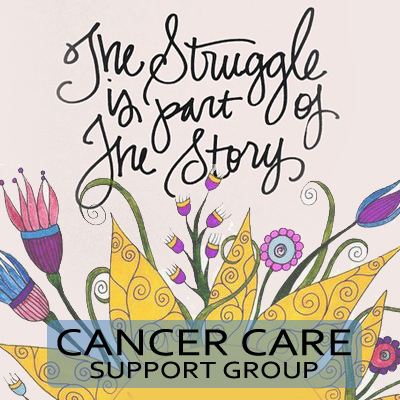 Cancer Support groups present information, provide comfort, teach coping skills, help reduce anxiety, and provide a place for people to share common concerns and emotional support. People who take part in support groups believe that they can live healthier, happier lives if they spend time relating to others. They say that when they have emotional support, it is easier to deal with their health and social problems. Some claim that the bonds formed between members of support groups help them feel stronger. They further claim that sharing feelings and experiences within support groups can reduce stress, fear, and anxiety and help to promote healing. Evidence suggests that support groups can improve quality of life for people with cancer. Come share your experience, strength and hope. 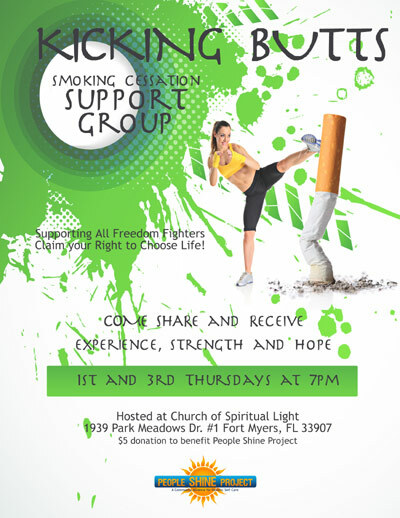 Receive the support of a community of people who share the intention to stop smoking. In this group we will be sharing our issues, including our successes, struggles, and victories. Former smokers welcome to come and share your experience. Come and join us - All are welcome - Open to the public. There group is a program of the People Shine Project. There is a suggested donation of $5 which goes directly to support the hard costs of the People Shine Project. The People Shine Project is a non-profit SW Florida community service program that promotes and facilitates integrative recovery and holistic self care practices through affordable classes, groups and workshops, as well as private consultations. But it's actually even more than that. The People Shine Project is a movement, which is starting to take hold at the grassroots level of community. It is the movement toward the use of transformational and holistic methods, coupled with more personal responsibility for self care. It is our vision to inspire and educate people to take a more balanced and proactive approach to self care, wellness and personal growth. As advocates for integrative medicine, we have formed a unique community alliance which allows us to bring over 50+ classes per month (and growing) together under one roof to support this vision. The power of prayer and intention in our lives is all important to the realization of our free will and to the creation of a life of our choosing. Prayer is the voice that we give to these choices as we petition the higher powers that be for the love, support, protection and abundance that are not only necessary to our physical survival, but also our spiritual evolution. For in the asking, we come to realize that all is given, especially when we embrace the shamanic nature of our being and become the tracker in our lives. When we gather in community on the medicine wheel we have milestones and markers, which allow us to not only see the signs and experience the synchronicities, but to better interpret them, offering us a way to ground, anchor and integrate the knowledge, or to simply have more patience as we build our own faith in the process of unfolding. With these spiritual eyes on the shamanic path we can see the often subtle responses to our prayers that will better allow the omnipotent forces that we have invoked to do their magic. And we can also better hear the instructions of our soul which can guide our actions and decisions. We came here to create. We are creators, or more aptly put, co-creators. 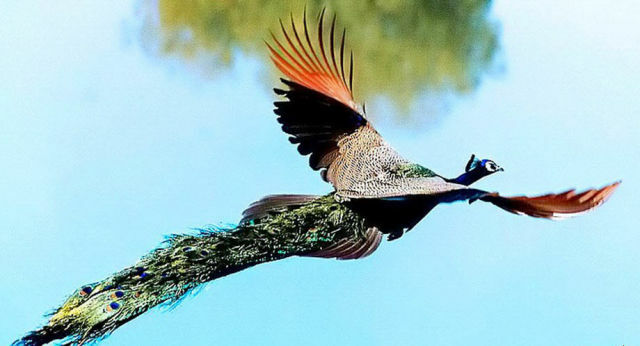 First through the protection of our ego we acted out our lives and created in unconscious ritual. As we learned more about who and what we truly are, we no longer act out only symbolically, but with reverence and respect as we create a new earth reality by taking these same rituals and framing and containing them in the story of our life under the protection of sacred ceremony... consciously and with positive intent. In our unawakened state we may have found ourselves relying a great deal on our own steam and forgetting to pray. Or we may have prayed, but only at times of sorrow, angst or fear. Most of us were plenty good at forming an intention, but painfully shy of releasing it to the Universe, which is actually what makes an intention, a prayer. Ultimately we want to integrate prayer and intention and weave a practice of ritual and ceremony into our lives that allows us to dance our prayers, sing our prayers, cook, clean and garden our prayers... create art, or sit in silence and be one with our intentions, certain of the soul's purpose and the desires of our heart, so that the very actions of our life take on new meaning under this high guidance. It's been a challenging journey, as we've experienced the knowledge of good and evil, duality and the polarizations of right and wrong doing. Now, unlike ever before, we have the opportunity to come to the center of our Self, the altar of our soul and pray in ways that make our whole life a sacred ceremony. When we pray we are speaking to the Divine, but when we wrap our prayers in ritual and ceremony, we are speaking directly and intimately to the divinity within our own being. We are speaking to our own soul and acknowledging that God comes through the people, the earth and that we are a great mystery. And as we leave room, the magic of the universe begins to respond back in spite of its mysterious nature, we can communicate meaningfully because we have framed and contained our desires in sacred space and surrendered them in complete faith. Make an intention to be listening with humility and awareness to the whispering of your soul. Then give a voice to it...spoken and written. Place it within the safe space of sacred ceremony. Enlivened with symbology, imagery, music... dance, drum and sweat your prayers... Annointed with precious oils. Activated with spiritual guides and angels. Taken into the silence of the void of your being. Align the Wills, then surrender fully to your soul, and to the Great Mystery. Watch and wait with calm certainty that the circumstances, the synergy and the guidance for right action will come and ultimately create something through this kind of surrender that far exceeds any meager wish that we can come up with on our own. That is the true power of prayer and intention. I pray and intend my life with humility, awareness and surrender. I claim my free will through the power of prayer. I raise the quality of my prayers. I pray for peace, love and joy for myself and others. I create a sacred space for my prayers. I seek to align with the divine will of my GodSelf. I allow heavenly and earth angels to love and support me. As an earth angel I am supportive of my fellow travelers and render aid in times of need. I create a sacred life that inspires the world to wonder. I invoke the higher powers of the universe to reveal and support my life purpose. The more I recognize and acknowledge my life purpose, the more power and support comes to me. I embrace the mystery of my life. I wrap my prayers in the protection of the medicine wheel and intend for my highest good. My intentions are for the highest good of all concerned. I am open to this or something better and welcome the creativity of my higher power. I pray for guidance in all aspects of my life. I ask and it is given. I knock and the door is opened. In prayer I come to a better understanding of myself. I inspire and infuse my prayers with sacred ceremony and ritual. My prayers are made whole within the the sacred container of the medicine wheel. I meditate, listen, journal and use divination to determine my heart's desires. I want for nothing, and choose to create my bliss. My joyful creations add to the beauty of the earth. I send lovingkindness to all. I allow myself to receive good into my life. My entire life is a sacrament and a prayer. I will to will thy will..